Rhonda, who served as SOCAP’s Vice President of Events from 2016-2017, brings with her 10+ years of expertise in management and customized consultative partnerships. OnBrand24 is excited to be involved with SOCAP and to share Rhonda’s talents with this highly respected organization. Rhonda’s innovative and transformative approach has had a tangible effect directly resulting in the growth of OnBrand24 and its own customer satisfaction. 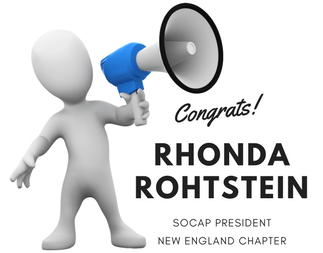 One of Rhonda’s goals as President is to increase the involvement of SOCAPs current membership using knowledge sharing and collaboration, as well as to expand SOCAPs influence in the New England area and engage more businesses. As a convener, Rhonda is accustomed to calling together a cross-sector of practitioners dedicated to creating positive customer service, which in turn, increases the flow of revenue. Rhonda understands first-hand the importance of team building as she’s managed teams throughout her OnBrand24 career. Rhonda’s own inventive and collaborative approach has successfully improved OnBrand24’s proactive teamwork, building the spirit of comradery; taking on new projects with more productive meetings, enriching the corporate culture, and supporting each other’s efforts. Membership organizations like SOCAP help businesses like OnBrand24 generate new ideas to better align the company with their customer’s needs and enhance their productivity. SOCAP provides answers and tools in the form of peer-to-peer collaboration encouraging efficiency, addressing unique goals, and getting high quality results. In large or small companies, often the right hand doesn’t know what the left hand is doing. This results in a lot of confusion, duplication of efforts, tasks that fall through the cracks and worse yet, money left on the table—all of which contributes to a negative impact on the company and a lot of unhappy customers. Companies can’t be good at everything—which is why it’s beneficial to work with partners. Relinquishing some control is a good thing in that it invites new ideas leading to new ways to look at your business. Collaboration also provides clarity as employees and their employers can better define their roles with less duplication. Organizations like SOCAP provide collaborating partnerships and networking with access to better workers and an exchange of ideas for new products and better technology all of which improves productivity. As Rhonda takes the lead, we’ll be excited to see the next phase for SOCAP New England and the extraordinary results from collaboration.